Becoming a Scribe and Loving it! Have you ever transcribed a portion of Scripture? What about an entire book of the Bible? I had never done either of those things and to be perfectly honest it really never crossed my mind to ever do something like that. 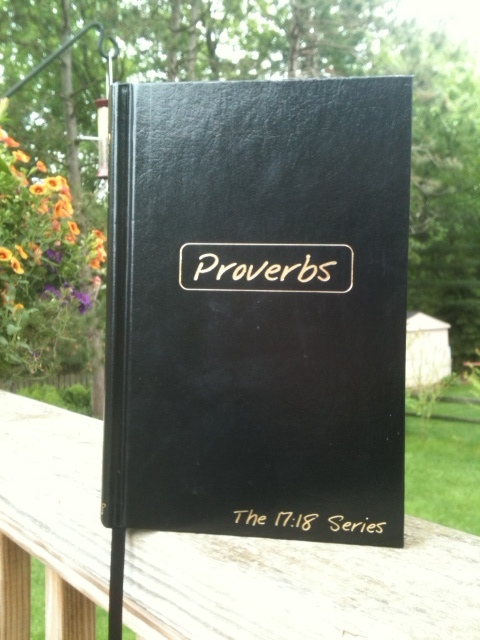 But this last year my son was given a project in his Bible class at school to write out the whole book of Proverbs! I decided that if my 8th grade son could do something like this than I could do it too, doggone it! Every person in the class was given a book called a “Journible” (Bible/Journal). In this book you copy the verses of scripture on the right hand side of the page only and on the left hand side of the page there are lines for you to journal your thoughts, prayers and questions. I decided that if I was going to do it right and really make a commitment to it that I needed one of these books to help me in my endeavor. Sitting down with my new Journible I read the introduction and explanation of why journaling the Bible is important. Even though I have read the Bible through a few times, this concept was completely new to me. I was amazed not just that this was a command to the Kings of Israel but why they were commanded to do this as well. It didn’t take me long to realize how incredible this simple tool was going to be in my life. I found it to be a natural way to spend time in God’s Word with my Heavenly Father, meditating and thinking on what had been written. For me studying is tedious and hard and does not create intimacy with my Father but this, this was exactly what I had been longing for in my time alone with God. Copying down scripture caused me to slow down; to not skim over passages that were familiar. You see, I have a tendency to jump, skim, glance over Scripture that is well-known and I don’t take the time to really experience the Scripture. This discipline forced me to stop, reflect and experience what I was reading and writing. It was like taking a huge magnifying glass to the Word of God. As I journeyed through the book of Proverbs this summer, I was amazed at the things God taught me. There were times when I was copying down the scripture and I would think, “Wait a minute, I already copied this down. Am I in the wrong spot?” Then I would realize that it wasn’t the wrong spot, it was just being repeated again verbatim, which then lead me to recognize that what I was writing must be pretty important if it was being repeated over again. That was something I would never have seen just reading through Scripture. I’m now on the book of Luke (Did you know the 1st chapter has 80 verses?!) and it is so different from the book of Proverbs! I love it in a completely different way than I loved Proverbs. And once again, God is teaching me how precious His Word truly is! If you’re interested in joining me in this endeavor, here’s a link to ordering your own Journible: www.heritagebooks.org. or http://www.the1718series.com/#!purchase Of course you can always get a regular journal and copy down Scripture that way as well. I have just found these books to be a wonderful treasure that I will be able to pass down to my children. (They will have a book of the Bible copied down in their Mom’s handwriting with thoughts and prayers of what God was doing in her life as she journeyed through various books of God’s Word.) And my children will be able to pass down to their children as well. What a wonderful legacy to leave my family! I’d love to hear how God is using this in your life if you take the challenge and join me in this undertaking. Oh, Kristi – I remember you talking about doing Proverbs, and I'm so glad you've moved on to Luke. This is something that sounds SO valuable. I may have to do this as well. Wow. This sounds like something worth doing. I think I would like to try it! !